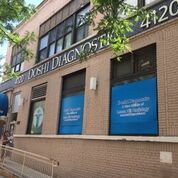 Washington Heights, a former Doshi Radiology center, is part of the Lenox Hill Radiology (LHR) network of 25 outpatient radiology centers in the New York metropolitan area. A full service imaging center located in Manhattan, Lenox Hill Radiology offers MRI and open MRI for claustrophobic patients, CT, biopsy, nuclear medicine, ultrasound, thyroid ultrasound for fine needle aspiration, digital X-Ray, and DEXA for bone density measurement. Located near the corner of West 174th and Broadway, LHR in Washington Heights is just a few blocks away from New York Presbyterian Hospital and the Columbia University Medical Center (0.3 miles) and is easy to get to by train or bus. At Lenox Hill Radiology our combination of dedicated specialty physicians, friendly compassionate staff and cutting edge technology allow us to offer our patients only the very best in diagnosis, management, follow up and care.